Home » Blog » News » Novels into Films. Email from Meade Heights Elementary. Elephant Run. Here’s a nice email from from teacher Jane Chitwood asking about novels into film and my answer. I am an elementary school librarian at Meade Heights Elementary in Fort Meade,MD. I am working with a group of eleven 5th graders. We call our class \”A Walk to Enrichment\”. Our school is primarily made up of low income and enlisted military families. Some of them come from pretty tough neighborhoods. 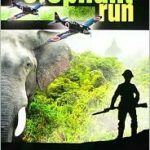 They are a group of exceptional young students who chose your book, Elephant Run, to read and critique. Their backgroup information was very limited and it took some time to get through the history of your novel. Most of them know where the local Mall is and that is about it. Burma is a place that they had no concept of what so ever! Your novel took them to places they can only dream about…. They loved it and want you to know that they think it would make a GREAT movie! I would agree. I thought you\’d would like to know their reaction…they are ready for more of your books! Wish I could keep them for another year! Oh, they want to know who they can write to push for a movie???? Most of my novels have been “optioned” for film, some of them several times. Here how it works. When I have a novel come out a producer calls or emails and says: “I love your novel. I want to turn it into a film.” I sell them the option. This means that they have the option of making my novel into a film for one or two years. If they don’t raise the millions and millions of dollars to turn the book into a film I get the option back and I can sell it to another producer. A lot of books get optioned, but very few of them become films. It’s difficult to raise the money to make a film. Right now I have four novels under option, PEAK, ELEPHANT RUN, CRYPTID HUNTERS, and I,Q. Will any of them become films? Hopefully one day. I have a novel, the one I mention, which many readers have suggested would make a great movie. I have even started writing my own screenplay for the book, but it is not easy. ← Secondary Reading Council of Florida. I,Q2.